Maintenance-free belt requires no lubrication or retensioning. 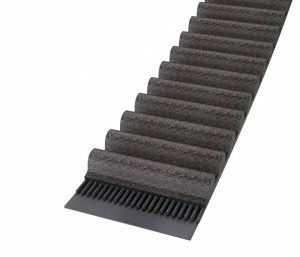 It’s one of the strongest rubber timing belts in the market: The Synchroforce Carbon is technology company ContiTech’s new heavy-duty timing belt with a hybrid tension member made of a glass carbon compound, which offers a similar performance to polyurethane belts. Due to the impressive properties of its rubber compound, it scores even further. The Synchroforce Carbon transmits rotary motion with great angular precision. Thanks to its innovative hybrid tension member, which combines the advantages of carbon and glass, the belt offers high tear strength and dynamic load capacity. This enables synchronous drives to operate in extremely tight spaces – creating the ideal conditions for designing cost-effective drives with a small installed size and low weight. The Synchroforce Carbon is suitable for tropical climates, resistant to ozone and to oil, temperature-resistant from -30°C to +130°C, electrically conductive to ISO 9563 and very silent. Thanks to its special material properties, the timing belt is maintenance-free, so there is no need for lubrication or retensioning. The Synchroforce Carbon is available in HTD, STD and CTD sections and an 8M pitch. The belt replaces the Synchroforce Extreme and offers another five percent more performance.